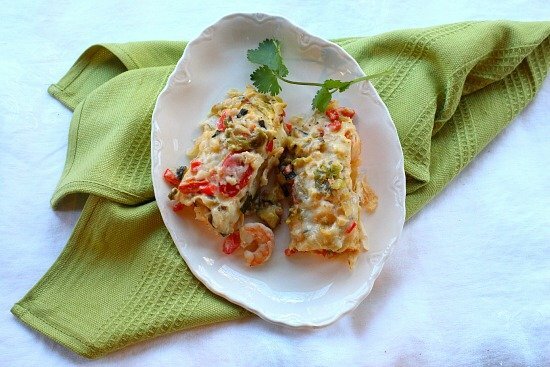 Stuffed with a cheese sauce and sautéed shrimp, rolled up and wrapped tight, these Mexican shrimp burritos are baked into a creamy …rich … and decadent treat. Today’s #SundaySupper theme is “stuff it, roll it and wrap it”. We were to think sandwiches, wraps, tacos, calzones, dumplings, wontons, corndogs, empanadas, samosas, ravioli, spring rolls, egg rolls, lettuce wraps, burritos. Anything stuffed that has a filling with something wrapped around it. Which equals everything I absolutely love. And if you’re not familiar, the #SundaySupper movement was started by Isabel over at Family Foodie as a project for “bringing back Sunday supper around the family table.” Who can argue with that??? And a special thanks to Amy over at Kimchimom for being our hostess. These burritos are made with shrimp that’s been sautéed with green onions and wrapped inside a fluffy white tortillas and drizzled with a thickened sauce of Monterey Jack and sour cream that’s been spiked with onion, red bell, jalapeno and Hatch peppers, tomatillo, tomato and zucchini. After the burritos are rolled and wrapped tight, they’re then smothered with more of the sauce, more cheese and baked until bubbly…and on my plate please! Don’t let the long list of ingredients scare you away. The end result is melt in your mouth treat that will have your guests begging for the recipe. 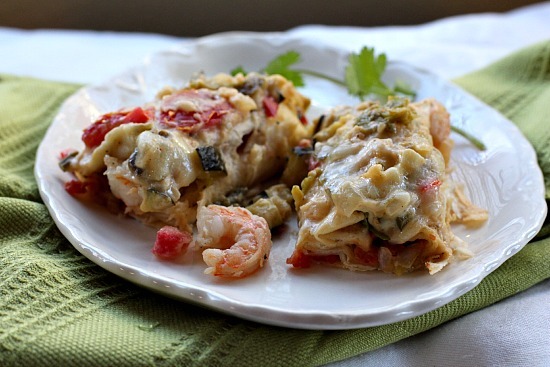 I hope you give this recipe for Mexican Shrimp Burritos a try. And if you do, please come back and let me know how you liked it and give the recipe a star rating. Your feedback is valuable to me for developing future recipes. And if you have a favorite shrimp burrito recipe, let me know, I’d love to give it a try. Sauteed Sweet Shrimp with a Sour Cream Cheese Sauce for an Easy Mexican Shrimp Burrito. Preheat oven to 350 degrees. Spray a 9 x 9 inch baking dish with PAM. In a saucepan heat 1 tablespoon of olive oil over medium heat. Add bell pepper, onion, chile peppers, tomatillo, zucchini and oregano. Cook until tender, about 5 minutes. Add garlic and cook until fragrant. Stir in salt, pepper and cayenne. In a small bowl, combine flour and water and whisk to blend. Add to vegetable mixture. Add milk and stir until well blended. Reduce heat and simmer until slightly thickened, about 3 minutes. Add 1/2 cup of the Monterey Jack cheese and stir until melted. Remove from heat and stir in sour cream. In a skillet, heat remaining 1 tablespoon olive oil over medium heat. Add shrimp. Stir until shrimp just turn pink, about 2 minutes. Stir in half of the vegetable cream sauce mixture and half of the tomatoes. Remove from heat. Lay out flour tortillas and fill each equally with the shrimp mixture. Roll tightly and place seam side down in the baking dish. Top burritos with remaining half of the vegetable cream sauce mixture. Cover the pan with foil and bake 30 minutes or until thoroughly heated. Top with remaining 1/2 cup of Monterey Jack cheese, sliced green onions and remaining chopped tomatoes. Serve immediately. 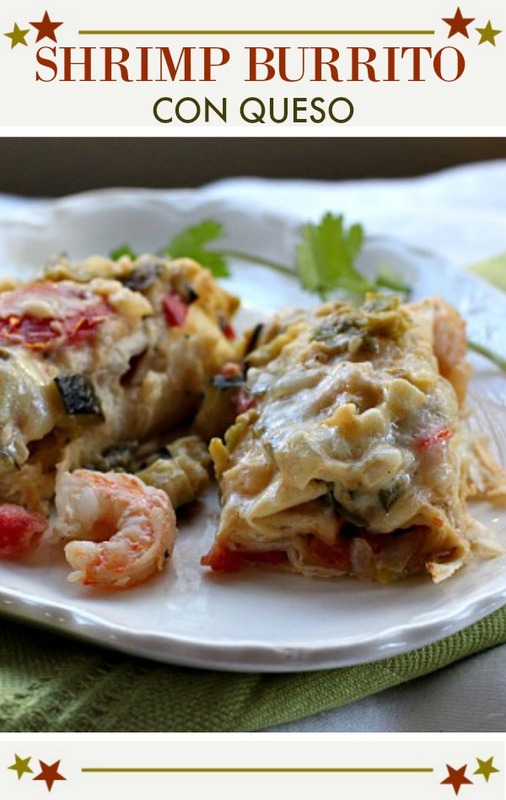 Mexican Shrimp Burritos Con Queso …It’s what’s for #SundaySupper. Dear lawd above, your shrimp burritos look out of this world! Talk about flavourful, indulgent, and decadent! I loooooooove shrimp and all white sauces. This would be the perfect meal! love the “dear lawd”. And that’s exactly what I thought upon first bite. Thanks so much for stopping in and the comment. Heading over to your place to take a look. 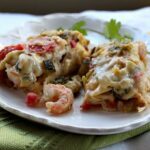 I love shrimp burritos and these are no exception! Looks scrumptious! Thanks Amy Kim. And thanks for stopping in and the comment. Always love new visitors. Love how you’ve transformed the typical burrito into anything BUT typical! I…. cannot handle this…. OMG, these sound so utterly delicious I can’t even believe. Must pin now!!! I can see these burritos becoming a favorite! I’ll be trying then next week. Thank you! I made these tonight. They were amazing! So flavorful…. Absolutely delicious. Terry suggested I not lose this recipe. Thank you for sharing. Our dinner was super.